For quick, accurate, and efficient coding, pick this practical HCPCS reference! 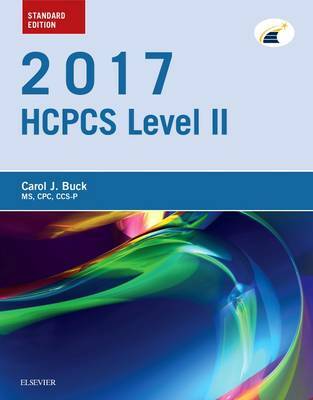 From coding expert Carol J. Buck, 2017 HCPCS Level II, Standard Edition provides an easy-to-use guide to the latest Healthcare Common Procedure Coding System codes. It helps you locate specific codes, comply with coding regulations, optimize reimbursement for equipment and supplies, report patient data, code Medicare cases, and more. This standard edition simplifies the basics of HCPCS coding - and you save money! At-a-glance code listings and distinctive symbols identify all new, revised, and deleted codes for 2017. Drug code annotations identify brand-name drugs as well as drugs that appear on the National Drug Code (NDC) directory and other Food and Drug Administration (FDA) approved drugs. Alerts indicate the codes that have special coverage instructions, are not valid or covered by Medicare, or may be paid at the carrier's discretion. Jurisdiction symbol shows the appropriate contractor to be billed for suppliers submitting claims to Medicare contractors, Part B carriers, and Medicare administrative contractors submitting for DMEPOS services provided. Table of Drugs makes it easier to find specific drug information. Codingupdates.com website includes quarterly updates to HCPCS codes, updated content, and the opportunity to sign up for e-mail notifications of the newest updates. UPDATED 2017 official code set ensures compliance with current HCPCS standards, for fast and accurate coding.